Research on mindfulness meditation and depression shows how this all-natural depression therapy can work as well as drugs to conquer depression. Begin with this goal: 20 minutes a day for two weeks, taking one day a week off. Practicing first thing in the morning is preferable, but any time you can fit a quiet twenty minutes into your day will work. There has recently been an explosion of research in the area of meditation and depression, just as meditation’s popularity is rapidly expanding across the globe. A growing number of people suffering from depression, anxiety, stress, and other psychological problems are turning to meditation, particularly mindfulness meditation, to feel better both mentally and physically. Meditation, a simple technique that concentrates and calms the mind, is indeed a highly effective strategy for the treatment and prevention of depression, studies show. This article will first briefly discuss meditation and mindfulness, and then review the research on mindfulness meditation and depression. Meditation and Mindfulness, What are They? Meditation is neither extremely difficult nor mysterious, as many people believe. It’s simply a technique to practice focusing your attention. In one of the most popular and beneficial kinds of meditation, called mindfulness meditation, you focus your attention by intentionally bringing it, in a non-judgmental manner, to what you’re experiencing in the present moment. Learning to better focus your attention on what you’re experiencing in the present moment allows you to live more fully in the moment. Most people identify so strongly with their minds and thoughts that they believe they are their minds and thoughts. But this just doesn’t correspond to reality. Even during inevitable periods of doubt, self-judgment, difficulty, and depression, meditation helps you to recognize that this is not who you really are. Asian cultures were the first to practice meditation, which has historically been a core component in many spiritual practices, such as Buddhism. Although meditation is rooted in Buddhism, practicing it in no way requires an adherence to Buddhism or any adaptation of personal faith. The word itself is derived from two Latin words: meditari – to think, to dwell upon, or to exercise the mind, and mederi – to heal. Mindfulness-based cognitive therapy, a mindfulness-meditation program that also integrates tools of cognitive behavioral therapy, has been shown to significantly reduce depression symptoms in numerous studies. [3-5] Typically taught to groups of depressed patients in an eight-week series of weekly two-hour sessions, mindfulness-based cognitive therapy teaches people to become aware of and note upsetting thoughts and feelings and to conceptualize them as mental events instead of an internalized realistic representation of themselves or the situation they are in. 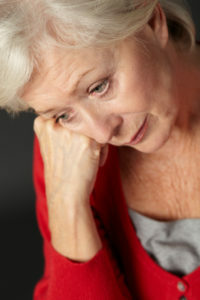 Depression is a chronic relapsing condition, with relapse rates of 50 percent to 80 percent. Mindfulness-based cognitive therapy has been found to lower the risk of depression relapse by 43 percent in patients with three or more prior episodes. Results from numerous studies show that participating in an eight-week course of mindfulness-based cognitive therapy protects people from depression relapse for at least 12 months after treatment, an effect similar to that of continued antidepressant medication. Are you ready to explore meditation as a treatment for your depression or as a way to prevent it from coming back? Begin with this goal: 20 minutes a day for two weeks, taking one day a week off. Practicing first thing in the morning is preferable, but any time you can fit a quiet twenty minutes into your day will work. Here’s what to do: Find a comfortable position sitting on cushion on the floor or in a chair. Notice the physical sensation of your breath as it comes in and goes out of your body. Find the place in your body where that physical sensation is the strongest. It might at the nostrils or the abdomen. Rest your attention on the place where the sensations of breathing are most strong. This is your “anchor” to the present moment. When you recognize that your attention has strayed from the breath to a thought, a physical sensation, or a sound, gently bring your attention back to the physical sensation of the breath going in and out of your body at your anchor spot. Sometimes, instead of returning your attention to your breath, a physical sensation becomes so compelling that you may want to let go of your focus on the breath and bring it the sensation with the same attentive quality that you brought to the breath. Just notice it without judging it—even if it’s unpleasant or painful. Once it becomes less compelling, return to the breath—your anchor to the present moment. You can also do this with a thought or emotion that has become so compelling that you can’t keep your focus on the breath. Shift your attention to the thought or emotion and just patiently watch it without judgment. They are not a fixed part of your identity–they come and go in the mind in an ever-changing flow. When the thought or emotion becomes less compelling, return your attention to your breath. Keep repeating steps four through seven until your timer goes off, using the physical sensation of the breath going in and out of your body as an anchor to return to over and over again. Wherever the meditation takes you, meet your experience with curiosity and open-heartedness, not judgment. Then gently open your eyes and go back to your day. In addition to practicing mindfulness meditation on your own, you may want to look into practicing with a group or taking a class. Many hospitals, medical clinics, and mental health clinics offer mindfulness-based classes. Or look for a meditation group that practices mindfulness or insight meditation in your area. You may also want to seek out a cognitive therapist who specializes in mindfulness-based cognitive therapy. With the simple and direct practice of moment-to-moment mindfulness, mindfulness meditation practitioners experience for themselves the ever-changing flow of the mind/body process. They cultivate a clear, stable, and non-judgmental awareness. This awareness helps bring calm and clarity to the pressures of daily life and leads to a fuller acceptance of the pleasure and pain, fear and joy, sadness and happiness that life inevitably brings. With meditation, there is hope, even if you’re chronically depressed. Give meditation a try for a couple of months and feel the difference it can make in your life. If you’ve tried mindfulness meditation or another type of meditation for depression, how did it work? Please share your experience in the comments section below. Psychol Res Behav Manag. 2012; 5: 131–141. Clin Psychol Rev. 2011 Aug;31(6):1032-40. J Med Internet Res. Mar 2014; 16(3): e87. Rockville (MD): Agency for Healthcare Research and Quality (US); 2014 Jan. Report No. : 13(14)-EHC116-EF. antidepressant, anxiety, clinical depression, cognitive behavioral therapy, depressed, depression, depression anxiety, depression studies, depression symptoms, exercise, for depression, health, meditation, meditation and mindfulness, meditation for depression, mental health, mindfulness, natural health, natural health advisory, pain, prevent depression, report, stress, studies show, suffering from depression, symptoms of depression. If this were really true there would not be a debate in the meditation communities, which has been going on for years, about long time meditators taking antidepressants so they can sit. Saying something works for good is not helpful and is untrue. You’re right. I wish we would not have used this title for the article. Some people who meditate still have depression. And some people with depression who begin a meditation practice will find that it is not helpful. There is no cure-all for depression or any other condition, for that matter. But mindfulness meditation may be very helpful for some people with depression and I hope this article encourages some people to try it.